At their 4th annual Oculus Connect event, Facebook formally announced a long-rumored expansion to their family of VR products – the Oculus Go, set to launch in early 2018. The Go is a standalone VR headset, meaning it does not need to be tethered to a computer for the headset to function; all processing and rendering is handled on the headset itself. Consumers will not need to purchase an expensive desktop PC or have their user experience limited by smartphones – with the Go, Oculus has made its first true foray into the mainstream consumer market. Performance-wise, the Oculus Go is expected to fall between phone-VR systems such as GearVR and fully-featured systems such as the Oculus Rift – finding the balance between the two ends of the performance spectrum will be key to drive consumer adoption. As discussed in our overview of VR article, the concept of a standalone VR headset is not new – HTC, one of Oculus’s main competitors, is planning to launch their own standalone headset for the Chinese market and is working with Google to develop a standalone set for the Daydream platform (See Exhibit 1). However, Oculus will be the first to the US market and will be the first true test for how popular VR can be in the mainstream consumer segment. The Go is launching at an initial price of $199, well below prices of current VR systems. Concurrently, Oculus is slashing the price of its flagship Rift VR system by another $200, following their July price cut – a 50% price cut in the last 3 months. The pricing for the flagship Oculus Rift now moves closer to price points where mainstream consumers may be willing to try out a more premium VR experience – the previous cut was enough to garner a renewed level of interest, and another cut could further juice demand ahead of the holiday season. This second round of cuts will likely have a ripple effect across the industry, as competitors like HTC and Sony will be under pressure to match Oculus’s price cuts. However, the sustainability of such pricing is a major concern, particularly for HTC. While HTC was able to sell part of its cell phone division to Google for an infusion of cash, further price cuts on its Vive system will likely put the margins for the product in the red and increase its burden on the struggling company. Critically, the Go’s price is low enough for many consumers – multiple consumer surveys  have revealed that the $100-$250 price point is attractive to a majority of consumers, especially if there is no additional hardware (e.g., computers) needed to run the headset. VR has yet to catch on with mainstream consumers thus far, and high barriers to entry, such as price and additional hardware requirements, are thought to be the main reason. With the Go, Oculus kills two birds with one stone and will likely entrench themselves as the leader in the industry. One important note is that Facebook will likely be subsidizing the Oculus Go at its $199 price point – while full product details / specifications are unavailable, Facebook looks to be taking the same route as gaming companies did with their consoles – subsidizing the hardware to sell software. While the VR industry is getting closer to mainstream consumers from a pricing perspective, it is still searching for the “killer app” on the content front. At the event, Oculus announced new content offerings such as a “Venues” feature that allows users to experience live events such as sports, concerts and movies, as well as a spate of new features for the Facebook spaces platform. However, at its core, VR is still focused on gaming, and a majority of consumers associate VR with gaming applications . Outside of gaming, there is a mishmash of fragmented niche applications or use cases that are not fully developed and developers have yet to catch lightning in a bottle. Without a broad, diverse slate of content, the Oculus Go may remain a novelty or niche product and fail to break into mainstream consumer homes. While the Oculus Go will be missing the holiday season, the price reduction on the Oculus Rift may generate significant buzz and be at a price point that is more palatable for many consumers. 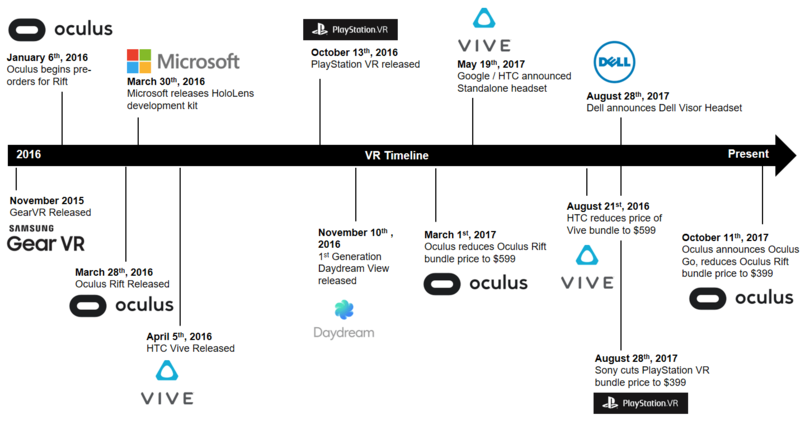 Continuing to grow the Oculus installed base is important to maintain interest and investment in content creation across the broader VR industry as it looks to move towards mainstream consumers. Competitors will likely launch their own standalone headsets in the near future as they seek to drive consumer adoption, but all eyes will be on how the Oculus Go performs to see if it is the break that the industry is looking for or if it will be yet another disappointing entry in the history of VR products.